28 year old male presented with a subcutaneous mass on his forehead. 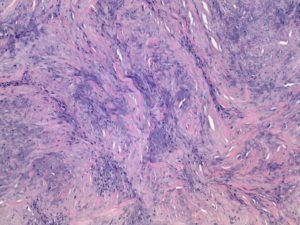 Sections show a nodular subcutaneous mass composed of spindled and epithelioid cells associated with blood vessels and a myxoid stroma. 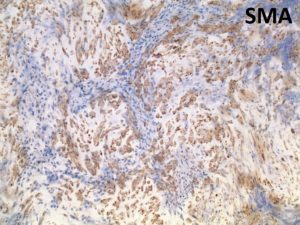 Immunohistochemical stain for smooth muscle actin (SMA) is positive within the spindle cells. 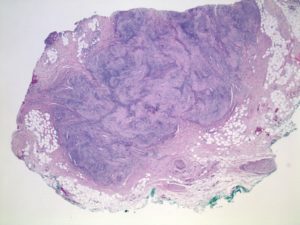 Adult myofibroma is a solitary, benign mesenchymal neoplasm that commonly presents on the head/neck region within the dermis or subcutaneous tissue. Histopathology reveals a nodular, biphasic mesenchymal neoplasm composed of myofibroblasts in fascicles or whorls and collections of small, primitive cells associated with hemangiopericytoma-like blood vessels. An accompanying myxoid or chondroid stroma is also present. The spindle cells express smooth muscle actin by immunohistochemistry. They are negative of desmin, EMA and S-100. A related entity is infantile or multicentric myofibromatosis, which is characterized by multifocal myofibromas typically presenting during the first decade of life. Visceral involvement and spontaneous regression can be seen. Adult myofibromas are benign and excision is curative. Some lesions of adult myofibromas may spontaneously regress. The spindle cells express smooth muscle actin by immunohistochemistry. They are negative of desmin and S-100.